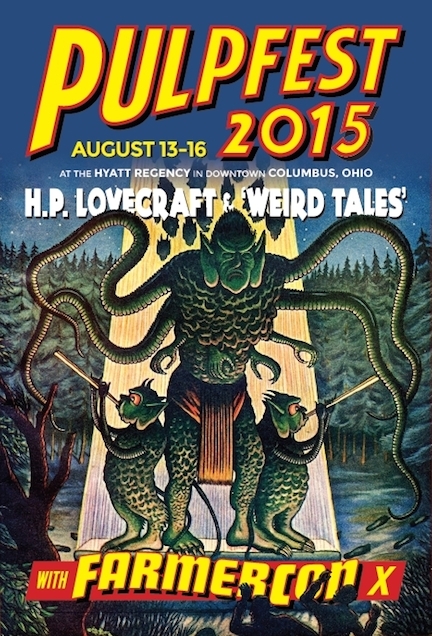 Seven weeks from today, the pulp-fan cognoscenti will descend upon Columbus, Ohio, for the seventh annual PulpFest. Launched in 2009 to continue the tradition of a summer show for readers, scholars and collectors of vintage rough-paper magazines and related items, PulpFest quickly made its mark on the hobby with a concentration on informative and entertaining programming, and this year’s convention should live up to the high standard set by its predecessors. Two anniversaries will dominate PulpFest programming in 2015: the 125th birthday of Weird Tales favorite H. P. Lovecraft and the 115th birthday of Leo Margulies, editorial director of the “Thrilling Group” pulp line. A blue-ribbon of pop-culture scholars (including yours truly) will participate in panel discussions and solo presentations covering some aspect of the Lovecraft-Weird Tales and Margulies-Thrilling Group connections. As always, separate programming tracks will be devoted to Farmercon, the annual gathering of Philip José Farmer devotees, and the various New Pulp luminaries who also will be exhibiting their wares in the spacious dealer’s room. Speaking of dealers, you’ll find plenty of them at PulpFest. Whether you collect pulps, pulp reprints, vintage paperbacks and hardcovers, fanzines, comics, or other examples of reading matter printed on paper, there’ll be lots of desirable items available no matter how limited your budget. There’s always a surfeit of action in a PulpFest dealer room and very few attendees manage to canvass the entire space during the convention’s three days — but it’s so much fun to try. For everything you need to know about PulpFest — dates, registration prices, hotel information, programming schedule, dealer list — just go to the con’s website here. You’ll see the Murania Press tables as soon as you walk through the front door, so don’t forget to stop by and say hi!